green goddess dressing – Girl Who Would be KING on Life, Style and INSPIRATION. GRILL TALK: Have you ever grilled lettuce? Ceasar salad has always been a favorite of mine. I’ve done the same dressing (slightly tweaked) for years and put it on my blog a while back – see LINK at bottom. Then I came across this one on yahoo & decided to try it. The main difference was not only the way the romaine was served, but using two whole (not just the yolk) eggs that were first coddled & the dressing made, non traditionally in a blender. 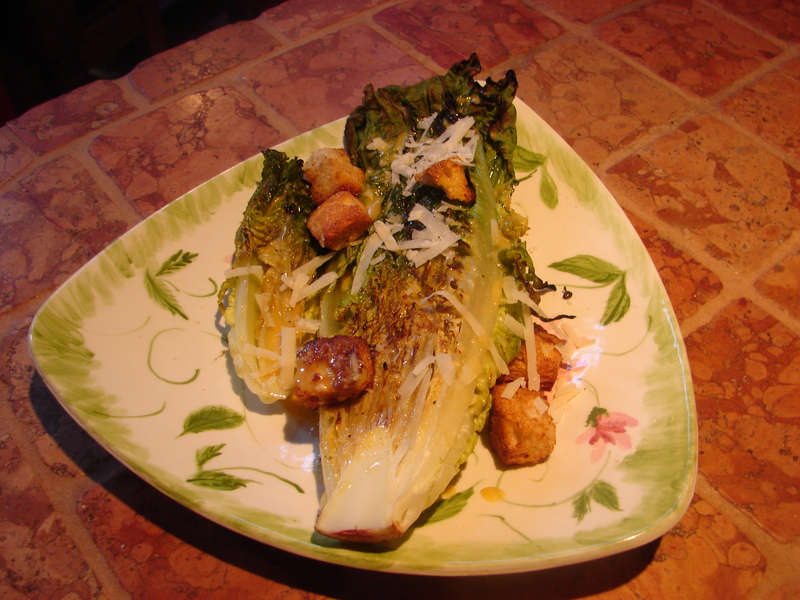 First the hearts of romaine were cut in half along the length but the bottom was not torn from the base (do not trim). Season the leaves with salt & pepper and drizzle with some olive oil then place cut side down on the grill until done. This will bring your salad to the next level – believe me. You can try this dressing or use the other one. Both are good with this simple and delicious way of preparing the salad – especially for Summer. Coddling 2 eggs: rinse and put in boiling water for one minute. Let sit for a few minutes and put them in the blender. **coddling is done to reduce or minimize the risk of bacterial contamination when using raw eggs. Add: red wine vinegar, grainy mustard, balsamic, Dijon mustard and blend. Add lemon, garlic, anchovy, parmesan, pinch of salt. Put in blender & slowly add olive oil. TIP: I also put a bit of tabasco, worcestershire & caper juice in this one. For Croutons: Take crusty bread & pour some olive oil over top. S+P. Spread on baking sheet in 350 degree oven until crisp. Top grilled lettuce with dressing & croutons, sliced fresh tomato (optional), top with parmesan cheese & enjoy! And do give me your feedback. To make dressing: In a food processor fitted with a metal blade, combine avocado, basil, parsley, tarragon, garlic, lemon juice, salt, and pepper and process until very smooth, scraping down sides. With the motor running, add olive oil. Add enough cold water to make dressing pourable, about 3/4 cup. Refrigerate until ready to serve. 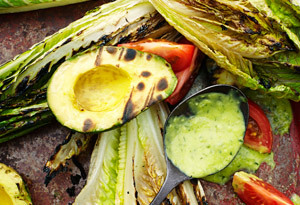 For the salad with grilled romaine you can add chopped tomatoes, onion, avocado, etc. You can even grill those too if you like.